with affordable ticket prices, expand cultural and arts education programming while preserving our historic landmark. 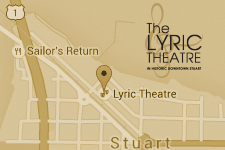 Ticket sales cover less than one-half of The Lyric’s artist fees, production costs and operating expenses like most not-for-profit performing arts venues. Memberships and donations are tax-deductible and help us to provide the community with a home for the performing arts that enhances the quality of life, educates and inspires our youth, and supports the local economy. BECOME A MEMBER TODAY! The "Fast Pass" to Great Seats & More Starting at only $50! Contact Membership Director, Heather Long, at 772-220-1942, ext 204 or membership@lyrictheatre.com for more information. ​MAKE A DONATION! No donation is too large or too small. Donations of any amount are needed, welcomed and appreciated every day. No matter the size of your gift, each donation makes a difference​. BECOME A SPONSOR! As an individual or a business you too can get your name in lights! Customize a show sponsorship package today. Contact Development Director, Linda Prange, at 772-220-1942, ext 209 or development@lyrictheatre.com for more information. ARTS & EDUCATION ~ Support & Inspire the Leaders of Tomorrow! Contact 772-220-1942, ext 207 or info@lyrictheatre.com for more information. GIVE A GIFT CERTIFICATE! Don't just give a gift...Give memories that will last a lifetime. If you're looking for a great gift idea for any occasion, we have just the ticket for everyone on your list! Available at The Lyric Theatre Box Office, call 772-286-7827. BECOME A PATRON PERKS PROVIDER! Join other esteemed area businesses in offering incentives and discounted services to our Patron Members. Each season, thousands of potential customers visit downtown Stuart on their way to The Lyric. Be a Patron Perk Provider and and get in on the action! Contact Membership Director, Heather Long, at 772-220-1942, ext 204 or membership@lyrictheatre.com for more information.